Dark Airing by David Hamlow is currently on display at ArtStart Rhinelander and features hobo symbols. During the Great Depression, there was what was known as a hobo jungle in Rhinelander. This Saturday, January 12th, ArtStart Rhinelander is holding a community event to remember it. The event ties in nicely with Dark Airing, an art exhibit on display at ArtStart through January 12th that features symbols hobos used back in the day to communicate with one another. Mackenzie Martin has the story as part of WXPR's We Live Up Here series. Those who have lived in Rhinelander for a long time might agree that in the 1950’s, it was a different place than it is today. Kids roamed slightly freer and there were less concerns about mysterious strangers. Bill Vancos is the President of the Rhinelander Historical Society Museum and he says from personal experience, everything was just a little simpler back then. Vancos was just a kid in Rhinelander in the 1950’s, but something he vividly remembers about that time are the remnants of what was known as Rhinelander’s hobo jungle. 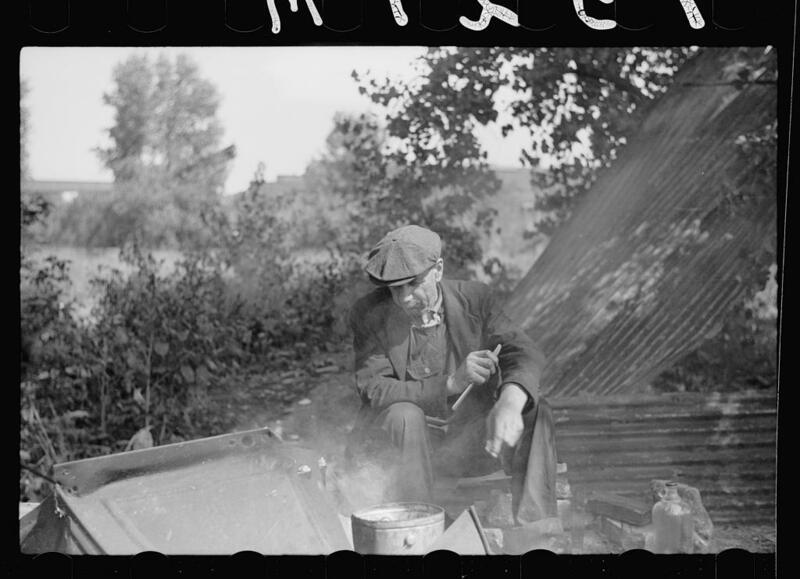 While today the word hobo is often used interchangeably with the word bum, hobos in the era of the Great Depression in the 1920’s and 1930’s weren’t bums. They were people traveling wherever there was work. It was estimated that four million men traveled around looking for work like this. Rhinelander’s hobo jungle was in the area known as the hollow near the old Sportsman's Cafe, what’s now known as the Dinky Diner. Bill Vancos knows a lot about the history of the hobo jungle in Rhinelander because for the last few weeks, he’s been interviewing people who have stories from that time period in Rhinelander’s history. It’s in preparation for an event this Saturday at ArtStart Rhinelander. He says that even though the Great Depression was a hard time for a lot of people, the stories he’s been hearing about Rhinelander’s hobo jungle are pretty funny. Like the story of June Theil, who is from Rhinelander but met her husband John in Chicago. How does one know which house to knock on for a free meal when traveling to a new town for the first time, though? It all has to do with the hobo code. In addition to hearing stories Saturday at ArtStart, there will also be a discussion of historic hobo symbols. 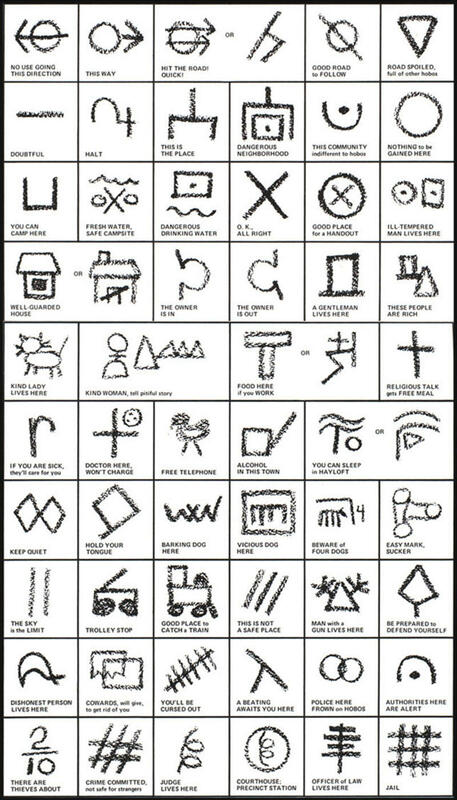 These are symbols that hobos used to tell other hobos where there were opportunities and dangers. For instance, a symbol that indicates “man with a gun” might warn someone to stay away from a house, while a symbol that indicates “food here” would tip off a new traveler that this is the right door to knock on. Hobo symbols are a big part of the current art exhibit at ArtStart by artist David Hamlow. If you haven’t seen Dark Airing yet, Saturday is your last chance. David Hamlow says hobos used the symbols rather than language for a lot of reasons back then, one of which was to keep their communication with one another secret. Hamlow also says that for him, these symbols bring to mind the national conversations happening right now about migrant workers. Bill Vancos says he’s sure Rhinelander would’ve been full of symbols indicating to hobos back then that it was a good town to stop in. He says one of Rhinelander’s first police chiefs—Morris Straub—was instrumental in making it a tolerant place for hobos. You can hear more about Rhinelander’s hobo jungle Saturday, January 12th at ArtStart Rhinelander from 4:00 p.m. - 6:00 p.m. There is no admission fee and you are encouraged to share your stories. The event is being held in collaboration with the Rhinelander Historical Society Museum, the Pioneer Park Historical Complex, and the Rhinelander District Library. This event is also your last chance to see the art exhibit Dark Airing by David Hamlow, who will be in attendance at the event. More information on the event and exhibit can be found here. More information about the hobo jungle in Rhinelander can also be found in Tales of the northwoods: Echoes from Rhinelander's past by Mark Miazga. This story is part of our We Live Up Here series, where we tell the stories of the people and history of northern Wisconsin.